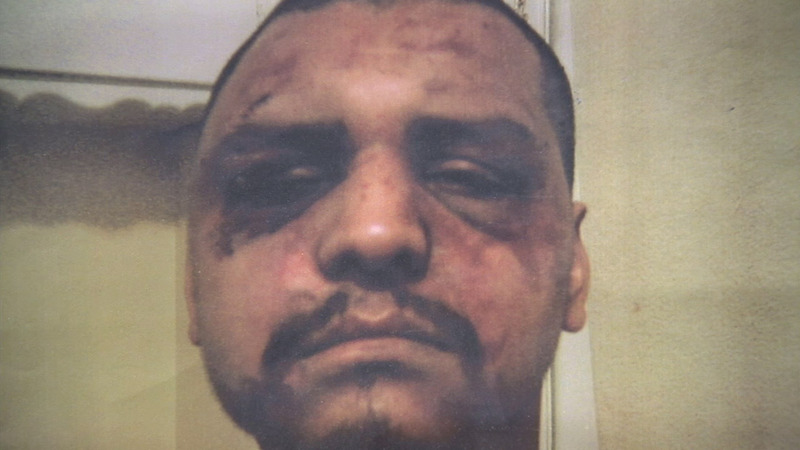 Gabriel Carrillo is shown in a photo showing the bruises he sustained after Los Angeles County sheriff's deputies beat him while visiting the Men's Central Jail in 2011. LOS ANGELES -- Two former Los Angeles County sheriff's deputies were sentenced to prison Monday for beating a handcuffed visitor at Men's Central Jail in 2011 and trying to cover it up. Fernando Luviano was sentenced to seven years in federal prison, and Sussie Ayala received a six-year sentence. Both were taken into custody to immediately begin serving their sentences. Ayala, Luviana and former Sgt. Eric Gonzalez were found guilty in June of deprivation of civil rights and falsification of records in the beating of Gabriel Carrillo, who was beaten up and pepper sprayed while in handcuffs. Carrillo was then was framed by the deputies who claimed that he had beaten them. Earlier in November, Gonzalez was sentenced to eight years for his role in the beating and cover-up. The case stems from a federal investigation of civil rights abuses and corruption at the nation's largest sheriff's department. Nearly two-dozen members of the department, including the former second-in-command, have been charged with crimes ranging from beatings to obstruction of justice.